As last year, fishing’s been tough for most of KNOM’s listeners, who depend upon area rivers to feed their families. Thank you for your wonderful support for our work. Please be sure to remember us and our listeners in your prayers, won’t you? FLASH: KNOM has won the Gabriel “Radio Station of the Year” Award for 2000! This is the 8th year, and the 5th in a row, that KNOM has been given this honor, which is among the highest in broadcasting. You can imagine how flabbergasted we were to hear this outstanding news. Tom Busch will accept this award on your behalf in Orlando, Florida on September 30th. If you can attend, please contact Tom immediately. We’d love to see you there. 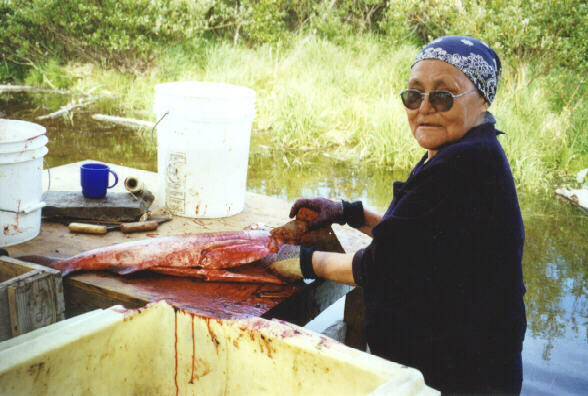 MAKING THE CUT: (left) Florence Busch’s mother Theresa Francis fillets a king salmon near her little smokehouse on a bank of the Andreafsky River, about 175 miles south of Nome. The Francis family was lucky; they harvested about 30% of the fish they need. closed all summer due to the scarcity of salmon. Many families caught nothing. The situation is even worse than last year’s catastrophic fish shortage, and that prompted Alaska Governor Tony Knowles to declare all of western Alaska a disaster area. INSPIRATIONAL SPOT: You can’t be led by the Great Shepherd until you become one of His sheep. UPDATE: The closest stations which are next to us on the dial, KCAM Glennallen, Alaska, and KCHU Valdez, Alaska have both agreed to a test of higher night-time power for KNOM. Right now, we’re working out details for an application to the FCC. Please stay tuned! 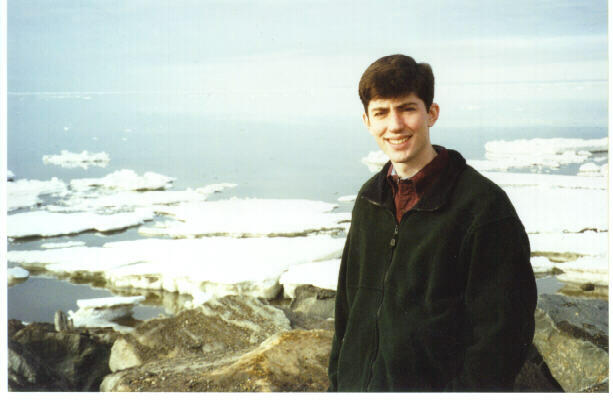 Beaming God’s Love throughout arctic Alaska since 1971... thanks to you. WELCOME to incoming volunteer Olin Fulmer (left). From Gainesville, GA, the 22-year-old is a graduate of the University of South Carolina, where he majored in Mass Communications and Journalism. When he’s not working, Olin enjoys running, biking and reading. GOODBYE… We thank volunteer music director Kelly Brabec (left) for two outstanding years of service as KNOM music director. Kelly plans to relocate to the Philadelphia area, and she carries our prayers and fond wishes. Thank you, Kelly! JUBILEE INSPIRATIONAL SPOT: God, I offer You thanks for the gift of my family. Help us to work together in peace. Give us grace to accept each other. Protect us from harsh words and hurt feelings. Lead us to encourage one another’s strengths and capabilities. May we always rejoice in each others’ successes. top THIRTY YEARS AGO: In August, 1970, the agonizing wait continued, as the government continued to drag its heels granting a right-of-way for the new Catholic station’s tower site. 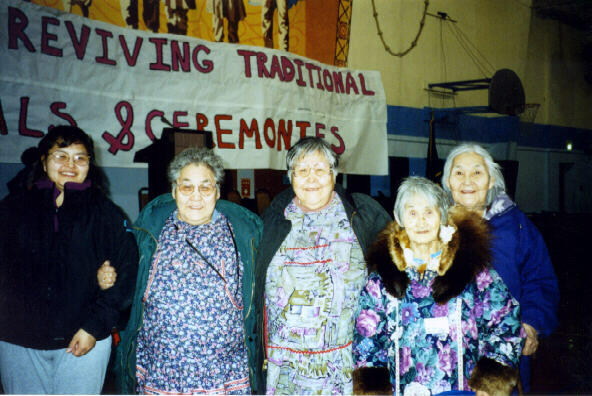 Some of the mission's organizers were reluctant to apply for the call letters “KNOM,” as they wanted the station to be more associated with remote villages than with Nome. No one, however, came up with a better suggestion, so KNOM it was. The Coast Guard had been assigned “KNOM” for the schooner “Chiquimula,” which had been scuttled, and the mission petitioned them to release the call sign. Meanwhile, a volunteer construction crew headed by Tom Karlin continued work on the studio building. 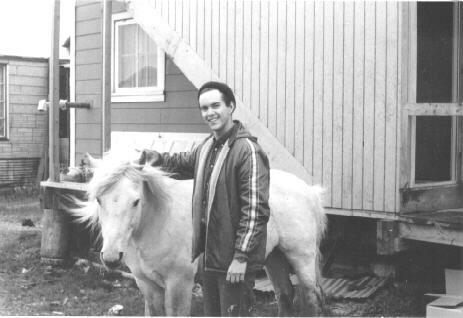 That year, Nome was a ONE HORSE TOWN (left), with one friendly mount by the name of “King,” who would meander by the studio building for a scratch behind the ears every day or so, here pictured with Tom Busch. IT’S HARD TO BELIEVE (left) that this is the guy in the upper photograph. 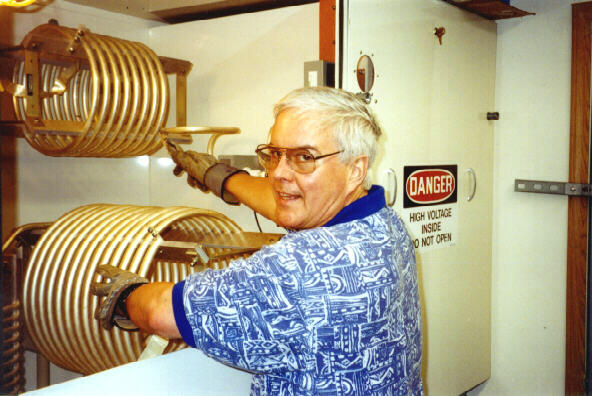 General manager Tom Busch, KNOM’s original engineer, tightens a connection inside the high-voltage antenna tuning unit. Once a year, Tom and engineer Les Brown “pop the hood” on all of the equipment to ensure that everything’s ship-shape. A careful procedure ensures that the electric power remains off during these high-voltage inspections. Please consider adding missions like KNOM to your will. All bequests are utilized for long-term improvements and for emergency savings. JUBILEE INSPIRATIONAL SPOT: There is great dignity in work. But only when the basic rights of workers are respected. Treat those who serve you with respect and thankfulness. 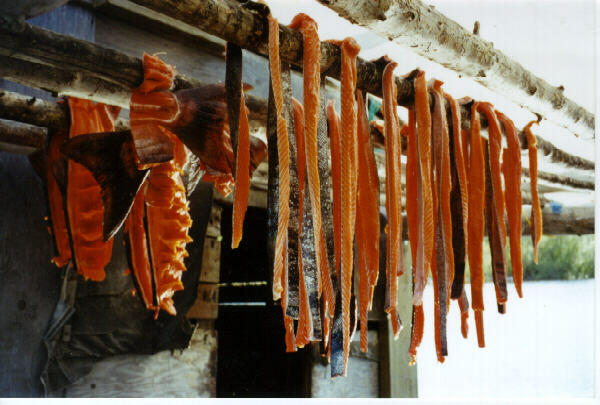 top HANGING AROUND: (left) Strips of freshly-cut salmon hang in the sun, waiting their turn in the little smokehouse. FLYING HIGH: Nome is directly beneath many of the “great circle routes” that connect Europe and North America with Asia. One of KNOM’s contributors is a commercial pilot. 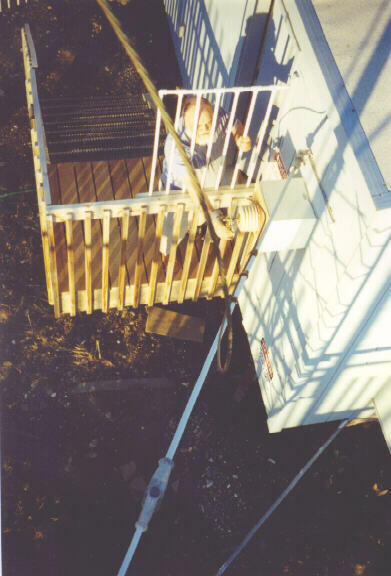 Recently, she wrote “I am flying to Asia from Detroit on a more regular basis so I have the opportunity to dial in 780 and listen in to the station at times. Last week…we were 565 statute miles into Russia...past Ugolny. At 37,000 feet we get good reception.” How about that? TIGHTENING UP: (left) During the annual maintenance, Les Brown tightens the AM tower’s main feed cable. When we’re on the air, this cable is energized at more than 4,000 volts. Notice the bright sunlight at 12:30 AM! ONCE MORE, thank you for your concern for those whom we serve, for your gifts which make our work possible, for your encouragement, your kind thoughts and your prayers. May God richly bless you and keep safe you and those you love. JUBILEE INSPIRATIONAL SPOT: We are one human family, no matter what our differences may be. Loving your neighbor will have a ripple effect around the world.